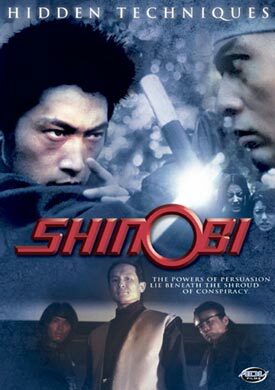 The Skinny: Two rogue ninjas are on the run in this B-grade continuation of the Shinobi series. For diehard ninja enthusiasts only; all others need not apply. Do you like ninjas? Well, if that's the case then maybe (just maybe) Shinobi: Hidden Techniques is right up your alley. The third installment in the direct-to-video Shinobi series once again centers on the dynamic duo of Kagerou (Kenji Matsuda) and Aoi (Maju Ozawa), two low-level ninjas looking to forge a life of their own away from their turncoat ninja clan. Accused of a crime they didn't commit, their only hope is to vacate the region and find freedom elsewhere. And the two heroes intend to do just that, but of course, things aren't that easy. It seems that trouble stands in their way in the form of…other ninjas. Bad ninjas. Ooh, scary. Like its predecessors, Shinobi: Hidden Techniques suffers from an inconsistent tone, low rent production values, and an overall anachronistic feel. For example, after an epic voice-over detailing the history of the ninja in the opening scene, the film suddenly plunges into a cheapo rehash of the ninja "skills" displayed in the first film. Even worse, the footage is shown at such a high speed that it looks like a ridiculously sped-up Keystone Cops parody, albeit Japanese-style. And it's in scenes like that where it's sometimes hard to tell whether you're supposed to be laughing with the filmmakers or at them. For what it's worth, Shinobi: Hidden Techniques consists mainly of wall-to-wall action sequences that range from "incomprehensible" to "not bad," interspersed with either scenes of the two heroes seriously contemplating the meaning of life or the villains elaborating on all the inter-ninja machinations that are going down in the film. And honestly, to even begin to comprehend what's going on, one needs more than a basic familiarity with the previous two entries in the series.